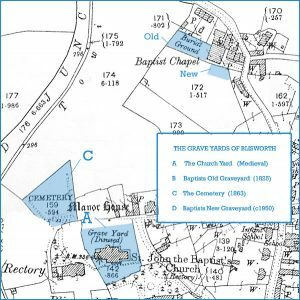 The four grave yards in Blisworth have received much more attention in recent years, in terms of upkeep and the preservation of wildlife, and this has been encouraged by the Northamptonshire Wild Life Trust. 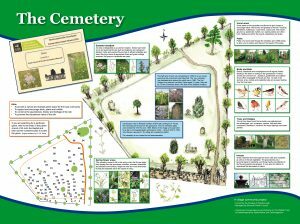 They run a Conservation Churchyard Award scheme in the county to help people increase the wildlife of their churchyards. 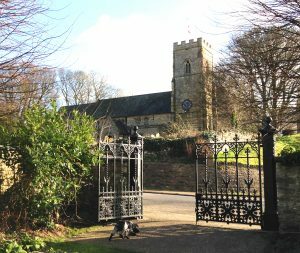 Judges visit all entrants and provide information on how best to encourage wildlife, as well as rewarding the best churchyards at an annual ceremony. Blisworth recently received a Silver award. Recent work has been organised by the Blisworth Progress Group, especially in regard to the Cemetery which is now a haven within the village, accessible to all for quiet reflection and to appreciate the wild flowers and wild life. In addition to the huge improvements to the cemetery grounds, the ancient wrought iron gates have been professionally restored and stand as testament to the tenacity of the team in gaining grants and permissions.